Journal of Animal Ecology is one of my dream journals as I said when I published my first JAE paper in 2015. Two years later, I am back. What happens to birds living in the wild when you instantly flood an area roughly the size of Chicago, forever changing their habitat? According to new U of T Scarborough research not only is there an overall loss of species, those that remain end up being very similar to each other. “You lose uniqueness, a full gamut of species that have their own distinct feeding strategies, physical characteristics and niches, not to mention genetic diversity,” says Marc Cadotte, an associate professor of Biology at U of T Scarborough. 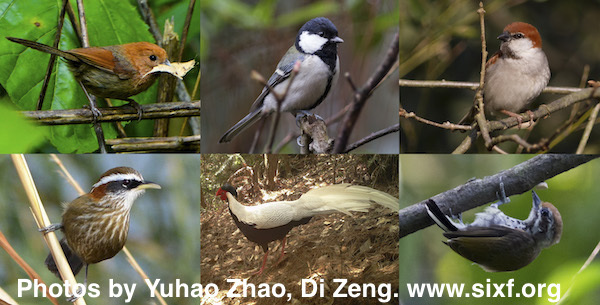 The study, led by Cadotte’s postdoctoral researcher Xingfeng Si and co-supervised by Professor Ping Ding from Zhejiang University, looked at what’s called community disassembly by focusing on birds living in the Thousand Island Lake area of China. The lake itself was formed in 1959 with the opening of the Xin’an River hydroelectric station. What was once a large area of continuous forest was instantly changed into a massive lake with more than a thousand islands, all of which used to be the tops of hills and mountains. As a result of creating an artificial lake, Si says the area offers a unique opportunity to study exactly what happens to wildlife when natural habitats are fragmented by human activity. “When the area was first flooded a bunch of species would have disappeared from the islands because some birds, like the silver pheasant, need a large territory,” he says. For some birds, the newly created islands were too small to maintain a population through a lack of space for nesting, food or other resources. Others that rely on foraging for insects, also wouldn’t be able to survive. The result was a significant drop in the number of birds living on these newly created islands. Si says that on the mainland close to the lake there are 55 different species of terrestrial breeding birds in total, but on larger islands that number drops to 44. On smaller islands, it’s about 20, or sometimes less. Cadotte says what ends up happening through disassembly is two forms of biodiversity loss. In addition to losing raw diversity, that is fewer species in general, the ones that remain are very similar to each other. The goal of the research, which will be published in the Journal of Animal Ecology, is to help researchers predict what kinds of communities will end up living in fragmented habitats. “A lot of human activity occurs without asking what the natural world will look like after or how biodiversity will be affected. Studies like this can help us answer questions about how much biodiversity the world will hold when we fragment habitats,” says Cadotte. “We have a lot of uninterrupted forests in Canada, but that’s changing. We’re moving further north, tearing up forests, expanding development into new areas and we should want to know how much biodiversity these altered ecosystems can hold,” he says. 1. Biodiversity change in anthropogenically transformed habitats is often nonrandom, yet the nature and importance of the different mechanisms shaping community structure are unclear. Here, we extend the classic Theory of Island Biogeography (TIB) to account for nonrandom processes by incorporating species traits and phylogenetic relationships into a study of faunal relaxation following habitat loss and fragmentation. 2. Two possible mechanisms can create nonrandom community patterns on fragment islands. First, small and isolated islands might consist of similar or closely related species because they are environmentally homogeneous or select for certain shared traits, such as dispersal ability. Alternatively, communities on small islands might contain more dissimilar or distantly related species than on large islands because limited space and resource availability result in greater competitive exclusion among species with high niche overlap. 3. Breeding birds were surveyed on 36 islands and two mainland sites annually from 2010 to 2014 in the Thousand Island Lake region, China. We assessed community structure of breeding birds on these subtropical land-bridge islands by integrating species’ trait and evolutionary distances. We additionally analysed habitat heterogeneity and variance in size ratios to distinguish biotic and abiotic processes of community assembly. 4. Results showed that functional-phylogenetic diversity increased with island area, and decreased with island isolation. Bird communities on the mainland were more diverse and generally less clustered than island bird communities and not different than randomly assembled communities. Bird communities on islands tend to be functionally similar and phylogenetically clustered, especially on small and isolated islands. 5. The nonrandom decline in species diversity and change in bird community structure with island area and isolation, along with the relatively homogeneous habitats on small islands, support the environmental filtering hypothesis. Our study demonstrates the importance of integrating multiple forms of diversity for understanding the effects of habitat loss and fragmentation, and further reveals that TIB could be extended to community measures by moving beyond assumptions of species equivalency in colonisation rates and extinction susceptibilities.